2.0	29-NOV-2002	Approved	Web Published with some edits to explain the history. This document describes the transmitter system supplied to Radio Glen for testing as designed and constructed by Henry. 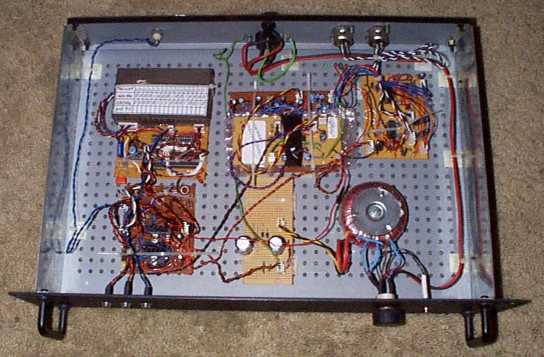 The transmitter is supplied in prototype form and has the physical limitations of an instrument constructed using prototyping techniques. The transmitter has been designed to conform to the Radio Authority and Wireless Telegraphy requirements but the user must realise that this transmitter has not passed formal type approval tests. The operating station licensee and the technical manager bear the responsibilty of ensuring that the transmitter is not used in such a way as to cause interference to other wireless services or as to cause danger due to electrical shock or fire. Due to the increased power output capability of the transmitter it is especially essential that the signal distibution system is maintained in good condition and checked regularly. Over two years from 1991 to 1993 I was technical manager of Radio Glen based at Glen Eyre Hall at Southampton University. The original radio distribution system based on a traditional RF induction system was still in use which was originally installed around 1978. This used a low-level (about 2Vpp) AM radio signal sent along standard coaxial cable with 30V DC. The small transmitter boxes in the attics and on the roofs of the buildings would use the 30Vdc to amplify the signal and feed it to a loop aerial of about 1m diameter. This gave enough magnetic output to penetrate just down to the lower floors of most of the buildings. The problem with the system was one of maintenance and inaccessibilty. Each of the small transmitter boxes had its own parallel tuning capacitor and output level control. This meant that if the level was set too high the transmitter would distort, if it was too low the output would be poor. If any changes were made to the system, then to ensure optimum performance, each and every small transmitter would have to be readjusted for best output. As some of the units are on top of four storey buildings with no roof access I decided to change the active transmitters to a passive system. Also, the transmitter modulator used was the same unit from 1978. Though it inarguably worked, it was a basic affair which formed part of the original Radio Glen third year project. About 1995 the station moved from F block to the new station near the old terraces. The same system was pressed into service with the power amplifier of the transmitter staying in the F block technical cupboard and the modulator moving to the new studio and sending low level RF though the conduit back to reception and on to F block. I thought it was about time the ye-olde transmitter and PA were replaced with something which sounded better and had more power to drive the passive loops. Though the project to build this started out as a replacement PA only, I got a bit enthusiastic and decided to do a new modulator as well. The design brief that I set would be that it would be as cheap as is humanly possible, as idiot proof as possible, and built entirely from Maplin components for easy replacement. The Maplin requirement fell by the wayside about 6 months into the design when it finally became clear that none of the transistors Maplin stocked were capable of good RF output. In the design as it stands, 90+% of the components are available from Farnell components, with only the toroidal iron powder cores being difficult to find in Britain. (They are easily ordered from the USA however.) The use of a synthesised frequency generator completely eliminates the traditionally difficult question of where to find the crystal. The original modulator has only the obligatory audio hard limiter and low pass filter prior to the actual modulator itself. Also this filter was set to the older standard of 4.5kHz bandwidth limit. The current system may have an Alice active limiter before the transmitter input, but that is the limit of the audio processing. The new modulator unit has three split bands of 2:1 audio compression followed by summation and a stage of overall active limiting. A hard limiter follows to cope with transient peaks and the resultant signal is low-pass filtered prior to the modulator. This should result in a great increase in perceived quality and loudness, as well as being vitually bombproofed against the most enthusiastic student presenter. The modulator and PA are in separate 19inch boxes so that the current division between studio and remote technical cupboard can be maintained. The PA has two outputs both capable of providing 10 Watts AM into the 50ohm system, and both RF input and output on the PA are isolated from the mains earth to avoid mains earth contention, and the kilometer wide earth loops currently endured. Well, the induction system is long since gone thanks to Wiggy's sterling efforts back in 1999 to get the low power free radiating license and a real transmitter. Wow, a real transmitter and aerial system from Radica, Luxury! For a while I thought that I would modify these units so that if the real transmitter failed or was reposessed, they could hook this up to the proper aerial and run on reduced power. I went as far as changing the frequency output of the modulator box and checking that the output from there would pass broadcast specs, which it would just about with the bit more audio filtering that I added. The PA was a different matter though. I'm not an RF engineer by training or at heart and the PA was simply not linear enough. I wasn't going to start building a new linear PA or making a high level modulated version so that project bit the dust. The old PA TX01 was scrapped, but the modulator still exists and I use it's meagre 2Vpp 50Ohm output sometimes for nostalgic 1287AM broadcasting around the house. Strictly speaking I suppose Radio Glen still own it. If their Radica setup breaks and they can't afford to get it fixed, you could probably use this modulator with a bit of a linear booster to drive a modified 160m band amateur radio linear amplifier. In practice, you proably wouldn't bother. I've put the design up on this site as an example of how to do some nice simple low cost and highly effective split band audio compression, and also how to make a nice simple frequency synthesiser to avoid using crystals. Turn the split band compressor into a five band version and you would have some seriously good sounding AM processing. The three band version is a bit light on the bass and treble. I wonder if I can find some old recordings? I suspect so... The schematics show the modified version which has an extra couple of poles of audio filtering bolted on and will just about pass broadcast specs. Audio Input:	Stereo standard line level 0dbm 775mVrms on XLR sockets balanced input. Ouput frequency:	Supplied as 1602kHz +/- 2Hz for University Radio Glen. Mod bandwidth:	-3dB at 6kHz from carrier, -40dB at 9kHz as required by WT regs. Modulation limiting:	Will not exceed 100% modulation with transient +10dBm 1kHz tone burst. Indicators:	Mains neon, 30V rail LED, Unregulated supply LED. Controls:	Dual on/off for each section. Dual input attenuators for each section. Ouput:	10W AM into 50 ohms from each section. The schematics reflect the circuit very closely. However there are no component references and occasionally you may be able to find a value on the schematic which is not correct according to the prototype. Also the op-amp sections and hence pin numbers will not match. The schematics are drawn using Windraft from IVEX design. This sheet shows the frequency synthesiser and modulator. The 74HC4060 uses a cheap 4.608MHz crystal to develop the 9kHz reference required for the VCO. The internationally agreed channel spacing in Europe on MW is 9kHz so all other frequencies are available by fairly simple circuit changes. The exact frequency of the output should be adjusted with the 10pF trimmer only when the circuit is fully warmed up and the crystal oven is operating normally. It is sufficient to adjust this by measuring the final output of the system at 1602kHz. The signal should be 1602kHz +/- 2Hz, so a frequency counter with seven or more digits is needed. The 74HC4046 has a centre operating frequency of approximately 1602kHz and a range of about 200kHz above and below this. Output from the VCO is divided by 178 in the 74HC4059 to form the comparison signal to feed into the phase comparator with the reference signal. If a frequency other than 1602kHz is required, this can be obtained by changing the setting of the divider. If a large change of frequency is required (eg for use on 963 or 999kHz) the loop filter and VCO free running components will also have to be changed. The values for all the resistors and capacitors of the VCO and reference oscillator can be found in the National Semiconductor or Philips HCMOS databooks. 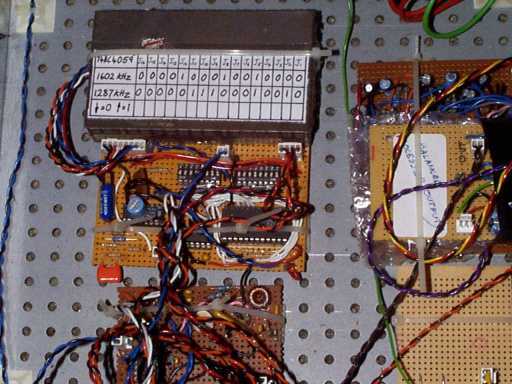 The only unusual component is the 100nF capacitor filtering pin 9 of the VCO. This reduces 9kHz phase noise on the output signal. (audible when tuned just off centre of the signal with an AM radio). The 10M resistor reduces phase noise also, though the mechanism by which this is happening is not fully understood. A better loop filter than the simple one used here is proposed for the next design iteration, using a 2 pole active filter rather than the 100nF capacitor, with the other filter components being similar. Schmitt triggers buffer the signal output and form an inverse of it. The true and inverse 1602kHz square waves are fed into the carrier inputs of the MC1496 modulator. The use of the true and inverted signals operates the modulator in a differential saturated mode. (See the Motorola or National Semiconductor databooks) This avoids the need for special balancing components and a constant amplitude carrier signal source. The 1k pot on pins 2 and 3 on the modulator is the only gain control in the RF section. This sets the RF output level ultimately delivered to the PA via the coaxial cable. The tuned transformer acts as a filter removing the higher order harmonics from the signal. This should be peaked for maximum output. Unbalanced audio is fed into the modulator. As the desired output signal is AM, not SSB or DSB, exact balancing is not important. The amount of residual carrier fed through with no audio is set by the ratio of the two resistors on pins 1 and 4 of the modulator. The stability of the modulator and these resistors is important as they effectively set the audio sensitivity of the modulator. Care must be taken to avoid noise and voltage dips on the 5V line as the VCO is sensitive to supply line changes. To this end, a separate 5V regulator has been included for the VCO alone, run from the 22V regulated rail. The PSU is straightforward and is covered adequately in the National Semiconductor regulator databook. The crystal oven heater control circuit uses an LM393 comparator and a Philips NTC thermistor. Points worth noting are the thermistor which is glued onto the top of the crystal with epoxy and the 120R heater resistors which surround the crystal on two sides and are also glued to it. The circuit has hysteresis provided by the comparator itself and the 2.2M feedback. This means that the BD139 operates in saturated mode except when switching, and the whole system is "stable", in so much as it is guaranteed to oscillate about the temperature set point reliably. Supply line glitches are minimised by the 47uF capacitor on the base of the BD139 slowing down the transistor switching time. Even so, a separate supply line and ground return direct to the regulator must be used for the heater current so that the VCO is not disturbed when the heater switches on and off. This is not shown schematically. Though not intended to be a deeply precision circuit, this should be sufficient to keep the crystal at an approximate elevated temperature of 30 or 40 degrees C, in order to ensure that the output is kept to +/-2Hz. The 10K pot on the inverting input sets the temperature which ought to be set with a therocouple or similar attached to the crystal. In practice, I would set it such that the heater comes on with about a 10% duty cycle at room temperature. The RF output stage currently uses a Nat Semi LM6361 shown. The output biasing diodes are glued to the metal transistor cases. The 2.2pF feedback resistor rolls off the output at frequencies much above 2MHz. This driver can give the required 2Vpp into 50R even with the 47R series output resistor. This resistor ensures that the output impedance is close to 50R and should avoid problems even if the cable to the PA is badly terminated. The 4.7K resistor on the RF line should not be any higher than this value or else the transformer on sheet MOD01-01.SCH exhibits too high a Q value and starts to filter out the AM sidebands. This sheet shows the front end of the audio processing. Throughout the audio sections, TL074s are used. Though far from being a rocket science audio op-amp, it is widely available, cheap, and intended for low-noise audio use. The differential left and right stereo inputs are converted to single ended and then summed together to form a mono signal. At the summing point there is also a division of amplitude by two for each signal. So if a zero dB tone is fed in phase to each input, a zero dB tone will result at the ouput of the summing amplifier. Three gyrator based filter stages follow. The Q of these stages is set such that the filters are two octave filters, ie the centre frequency of each filter is seperated by two octaves and the outputs, if summed back together would give a flat response. The design is lifted from a Maplin graphic equaliser design, but a similar circuit is described in the National Semiconductor op-amp databook. The three filters separate the low, mid and high audio frequency bands which go onto sheets MOD01-04.SCH and MOD01-05.SCH. Each of the low, mid and high sections are taken to nearly identical compressor stages. The stages for the low and mid bands are shown on MOD01-04.SCH. These are based around the inexpensive Philips NE572 compandor. These devices have several advantages over similar devices such as the technically superior SSM2120 from Analog Devices. 1) They are a lot cheaper and more widely available. 2) They work from a single supply - the SSM2120 does not, without going to extreme lengths. 3) The NE572 has independent attack and decay capacitors. 4) The NE572 does not have the pathological high frequency input oscillation of the expensive Analogue Devices part. The compressors are wired according to the Philips databook, with the unity gain point being set at 0dB for this application. This is more a matter of convenience for testing than function. The compressors are wired in such a way that they inherently produce 2:1 compression, ie a 2dB increase in the input will produce only a 1dB increase in the ouput. Producing ratios other than 2:1 1:2 or infinite (limiting/AGC behaviour) with the NE572 is difficult, and so our compression ratio is conveniently chosen for us. The attack capacitors are the smallest that can be used without getting a significant loss of level detection performance. As there are higher audio frequencies involved, the attack capacitors on the higher frequency sections have lower values. The output of each compressor section is summed back together. This output is fed into an active limiter stage consisting of the remaining NE572 section. The threshold of the limiter, ie the point at which no more increase in output is seen, is set to be 0dB nominally with the pot and diode arrangement fed from the 5V rail. This may be a little sensitive to temperature and voltage variations and may give a slightly soggy limiting point. In the next design iteration an op-amp fed from the NE572 voltage reference, and a diode drop temperature compensation scheme will be adopted. This being said, the simple circuit works perfectly well. The active limiter will bring down large signals to 0dB, but there is a delay before it can do this, due to the attack capacitor. Because of this a passive diode limiter is used after the active limiter to avoid overmodulation on transient audio peaks. When setting up, the active limiter is put into limiting by applying a +6dB audio signal to the inputs. The modulator drive pot is adjusted for about 80% modulation. The diode limiter pot is then adjusted such that the diode limiter is just starting to operate at 80% modulation. This means that there is only transient distortion of the signal by the diode limiter on speech peaks etc and the modulation never exceeds 100%, despite the modulation level being nearly 80% for much of the time during music. The diode limiter is quite soft in operation, giving a pleasantly progressive limiting action and producing minimal audible distortion. The processed audio is finally low pass filtered prior to being passed to the modulator. The filter is currently only six pole, and if this was the only form of filtering it would only produce half of the roll-off required at 9kHz. The Radio Authority regulations on this point stipulate that the modulated signal shall have at least -3db roll-off at 6.3 kHz and -40dB at 9kHz to avoid interference to stations on adjacent channels. Some additional filtering is actually provided in the RF tuned stages, where the bandpass elements have the same effect as the low pass elements in the audio stages, by reducing the level of the sidebands most distant from the carrier frequency. As I have not tested the output with a spectrum analyser yet, it may be necessary to put in more audio filter sections here to fully comply with the regulations. It is most unlikely that this system is any worse than the transistorised LPF in the current transmitter, especially as that has only an external active limiting system. Nov 2002: Extra poles were added when I changed the carrier frequency output as mentioned previously. There is only one sheet for the PA. Though the schematic closely follows the prototype, there may be a component substitution occasionally. The input signal from the modulator unit, presumed to be at the end of a long piece of coaxial cable enters the PA via an isolated BNC socket. The cable must be terminated externally with a 50R load. If the same cable is driving both PA sections, a T splitter must be used to connect both inputs together. Note that due to the relatively high input impedance of the PA inputs, one cable with a 50R teminator can easily drive both PA sections. The signal is coupled into the input transformer with a 1K resistor, ensuring that the input impedance will be >1K and mostly resistive. The secondary of the transformer is tuned and couples into the op-amp input. The 4K7 biasing resistor also damps the Q of this tuned circuit, ensuring that the sidebands of the signal do not get attenuated too much. The BD139/BD140 and op-amp combination is a standard push-pull configuration which forms the PA driver. If possible the base bias diodes should be glued to the transistors. The signal from the driver is AC coupled to the gate of the PA MOSFET. An LM317 is used to provide the gate bias for the MOSFET. This should be initially set such that the PA current is about 100mA with no signal input; this is generally around 4V. The PA bias can then be fine tuned by injecting an 80% modulated carrier from the modulator and adjusting the bias for maximum PA linearity when operating near full power. The 0.25R resistor in the source of the MOSFET provides some DC negative feedback to stabilise the bias point. The AC negative feedback components from drain to gate provide extra PA stability and tend to damp VHF harmonics which can be created when the PA is overdriven, or if the load is accidentally disconnected. The 10R gate resistor is another damping component to improve stability. The stability of the PA is very good, even when no load or a short is present at the output. The overdrive characteristic is very good too, with quite soft clipping appearing under overdrive conditions, prior to the current limit operating. The ouput from the PA MOSFET is matched into the output filter with a 1:4 transmission line transformer. The output filter is taken from standard filter tables and rolls off rapidly above 2MHz. If possible, future designs will use the next size up of toroid core for the filter inductors, so that thicker wire can be used. The PSU is entirely standard, except to note that it is possible to set the voltage operating point of the PA such that the LM317T is providing its maximum 1.5A just at the PA clipping point. In this way, if the PA is driven beyond the clip point, more current will be drawn and the LM317T will go into current limit shut down, discouraging further advancement of the gain control. This is a good way to provide the maximum possible peak ouput of the PA, while making it difficult to abuse. The 1:4 output impedance transformer and the input transformer electrically isolate the PA ground from the cable grounds. This breaks the loop which can be created when studio mains earth is connected to F-block mains earth and possibly any other block's mains earth if the coax connectors touch pipework in the attics. Hopefully this will reduce the amount of hum experienced both in the studio and when listening to the signal. I have experienced a situation where in certain orientaions an AM radio will produce a sound with a large hum content, despite the transmitted signal appearing clean. Rotating the radio will usually reduce it to a minimum, but the isolation now provided should help eliminate this problem. PA internal circuit ground is connected to mains earth and the PA chassis. There is an important safety aspect here as well. In the F block technical cupboard you have F block mains earth, possibly any other block's mains earth on the transmitter cables and possibly studio mains earth or even outside earth on the signal cable. As these could all vary in potential by hundreds of volts, even without a fault, (and believe me, they sometimes do!) you need to take care when in the technical cupboard. For example, do not grasp the chassis earth and the transmitter cable earth at the same time unless you can help it. There is no easy way round this, as we inevitably may get an ouside earth connection on the cables, and even this can be a potential hazard if it is led into a building with the modern PME earth system. The best way is to have all the mixed up earths where they are in the technical cupboard, safely out of harm's way. At least the PA isolation will stop the mile-wide ground current loops. The user of the PA now has access to 10 Watts of RF power. It is essential that the far end of the transmitter cables are terminated in 50R RF dummy loads capable of dissipating the power that they receive. The loads must be positioned or cased so that they are in absolutely no danger of starting a fire. Such (supposedly 15 Watt) loads are available from Maplin, but they do get quite warm and would need to be fixed into a case with vents. A better solution would be to buy a higher power load. The cable in general must now be kept in good order all the time, to avoid the possibilty of hotspots or high RF voltages appearing on the shield. When cable breaks occurred previously, with 0.5Watts, the system just stopped working. There is now safety to consider as well. Do not be tempted to overdrive the PA. The absolute maximum peak ouput is 100Vpp on modulation peaks. Remember that if you are setting up the transmitter with a tone it will only be about 80% modulated due to the active limiter, so you must leave room for musical peaks. Though not terribly technical I would recommend finally setting up the PA level, when installed, using music and adjusting the front panel input attenuator control until musical peaks just hit 80Vpp at the output, assuming that you desire maximum power. I don't recommend twiddling any of the pots in either modulator or PA, even with the benefit of the information provided here. When setting up, make sure that the internal phone system and other radio services are free of the signal. Radio Glen has been known to appear on the internal phone system under certain conditions. OK, so the idea of isolating the inputs and outputs on the PA wasn't such a great idea after all. In fact when you consider that the output transformers are only really DC isolating, all my great arguments start to fall to the ground somewhat. The PA was found to go a little bit unstable in the real system, characterised most noticeably by the gain controls not working terribly well. The PA is in use at the moment with the BNC plugs connected to the chassis with a piece of wire which cures the instability for the moment. The best course of action is to use non-isolated sockets for both input and output, to bridge the isolation gap between the inputs and outputs of the output transformer, and to bridge the isolation gaps between the bolts and the rest of the copper plane on the PA modules. This ought to consolidate all grounds to chassis and the mains earth connection. So this will take F-block mains earth into the new technical cupboard, where it will be isolated from earth there by the isolated output of the modulator. I did once mention that the old transmission system used to get hum on it sometimes, which was not visible on the RF output. I associated with big ground loops. Since this time I have considered the possibilty that some of this was caused by 100Hz FM modulation of the AM signal which was clearly audible when slightly off-tune but would not, indeed, be visible on an oscilloscope trace. Inside the case with a close up of the PLL board and tin box with the oscillator inside. I don't think that any pictures of the main transmitter PA exist any more.